Pacific salmon species introduced to Great Lakes tributaries in the 1960s bring a hard-fighting, West Coast fishing experience to the Midwestern streams where the fish return to spawn. But they also bring a relatively new supply of nutrients to streams that were once salmon-free. A new study shows that scientists are only beginning to understand how some basic ecosystem processes are affected by that extra dose of fertilizer. Salmon are an important source of ammonium, phosphorus and carbon to the river ecosystems that host their spawning runs. Scientists have typically studied how those nutrients affect the visible levels of the food web–organisms like algae, insects and other fish. What’s less clear is how salmon affect fundamental stream processes like nitrification, in which bacteria buried in stream sediment convert ammonium into nitrate. “Very few studies have considered how salmon nutrients may affect the bacterial community,” said Peter Levi, study author and postdoctoral research scientist in the Department of Bioscience at Aarhus University in Denmark. The question is especially important in Great Lakes watersheds, where salmon are relative newcomers. But in the Great Lakes, where fisheries managers have only been stocking salmon for around 50 years, the fish could indirectly serve as a man-made source of nutrients. 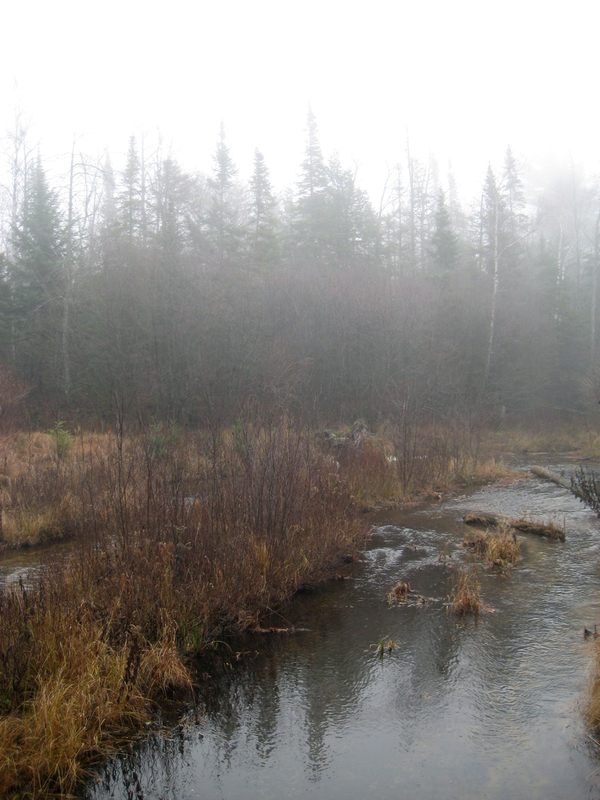 Though a salmon run delivers only a fraction of the nutrients that a stream might receive from agricultural runoff, some Great Lakes salmon streams flow through highly forested watersheds without much farmland. The influence of salmon on a stream’s bacterial community is worth studying, Levi said, because it could change how scientists think about the effect of salmon nutrients at the scale of the whole watershed. For example, salmon are known to excrete ammonium. Scientists attribute a local, in-stream fertilizing effect to salmon as they swim upstream because ammonium is a nitrogen compound readily taken up by nearby algae. But it’s also possible that a salmon run jump starts nitrification rates, causing sediment bacteria to convert the ammonium to nitrate. Though nitrate still contributes to algae growth, it isn’t taken up as quickly as ammonium and is more likely to flow downstream, accumulating at the mouth of the river. There, it could eventually fuel an algae bloom and contribute to hypoxia. In one of the first studies of the effects of salmon nutrients on stream bacterial processes, Levi measured nitrification rates in five Great Lakes salmon streams before, during and after the spawning run. He collected sediment cores across transects in five streams, three in Michigan and two in Ontario. The results of the study, published in the Journal of Geophysical Research: Biogeosciences, show that nitrification rates generally increased in the margins of the stream channel during the salmon run, but not in the center. The lack of an effect in the center, where salmon spend most of their time, could be a result of the disruptive effect the fish have on sediment as they swim upstream and dig their nests. The study is an early look at the effect of salmon on nitrification rates and can’t definitively pin an increase in nitrate concentrations on salmon. But the results suggest it’s possible that, despite efforts to cut agricultural nitrates in streams, the nutrient might be getting a small, unintended boost from salmon stocking programs.